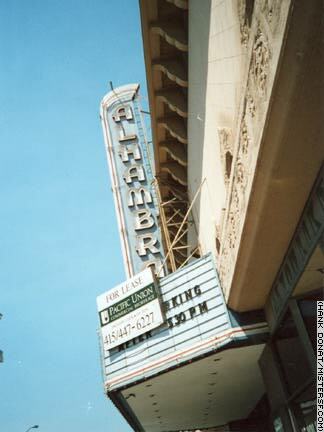 Alhambra Theatre, 2330 Polk Street. Detail The Alhambra Theatre on Polk Street at Union was among the last great movie palaces in the City. The former movie theatre is now a gym. Already in decline since the advent of television, single screen movie houses continued to disappear in the 1990s. In addition to the Alhambra, the Royal, Northpoint, Cinema 21, Pagoda Palace in North Beach, and Regency I & II also closed during this period of economic prosperity. These lost movie houses join several Mission District theatres as symbols of San Francisco's vanishing Neighborhood Cinema.